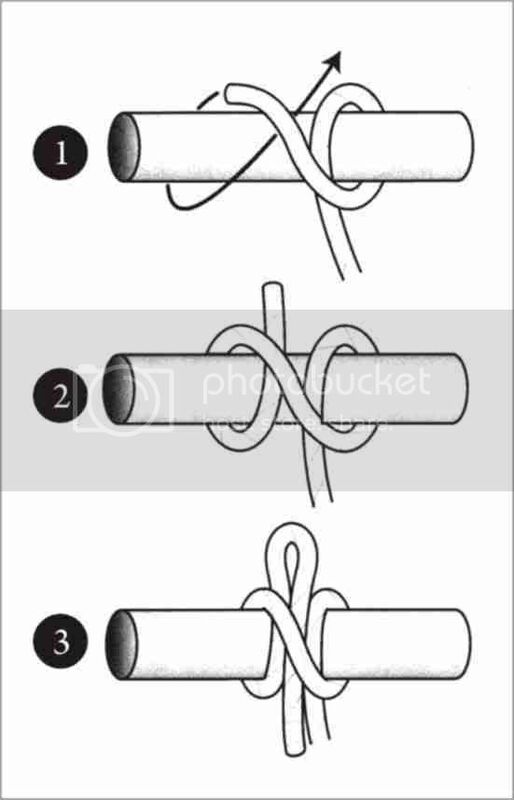 Method : This knot can be tied by tracing a letter N (or its mirror image) with the working end (1-2). For a temporary task, such as hanging a fender, leave a draw-loop (3). Stepping ashore from a slow-moving boat, first cast an underhand loop onto a bollard and use the friction to check the momentum; then, once the line is the length you want it, simply drop the second loop onto the first. Add a half-hitch for extra security.To ensure the direction of pull on a mooring painter does not vary, bring it ashore around a stanchion or other convenient fixed point before attaching it to a post or rail. History : An old treatise referred to this knot as a builder's knot. William Falconer may have been the first to name it the clove hitch in his Universal Dictionary of the Marine (1769). Aboard ship it was used to secure ratlines to shrouds, creating those rope ladders up which sailormen scrambled to man the yardarms.